Ambience Mall, Gurgaon is a premier mall in Gurgaon, which is the millennium city in Haryana. It contains an area of 19, 97,378 square feet. It’s a mall where every class of people are allowed, for relaxation, shopping and entertainment. Ambience Mall, Gurgaon has more than 230 stores and food outlets. It also has a very large parking space which can park about 4000 vehicles. The mall was opened for public in 2007 and became a great attraction for people from all walks of life. It has many national and international brands like Gap, H&M, Jamie's Pizzeria, Mc Donald’s, Nautica, Charles & Keith, Zara and etc. 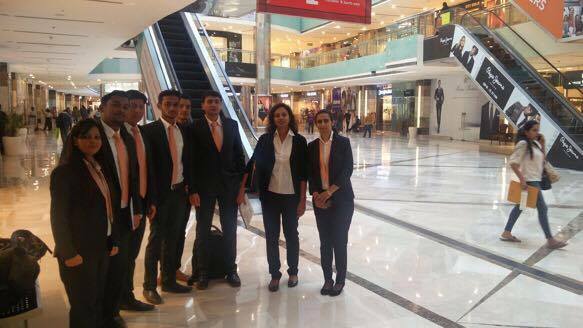 In order to provide our International Business Management students of Oct'16 batch a greater understanding about Organised Retail, Mall Management and Zoning of stores in a mall, INLEAD recently facilitated an Industry Visit for them to Ambience Mall, NH8, Gurgaon. Since some of the students had never been to a mall before, doing a comprehensive tour of a mall, which houses such huge number of international brands was quite an eye-opener for them. The knowledge about zoning and roster duties was new for them. The tour commenced with Mr. Kanwardip Singh, AGM Operations, Ambience Mall explaining about zoning, what zoning means and how it’s done. Zoning refers to the division of mall space into zones for the placement of various retailers, for example, at first floor, for gadget freaks and commoners alike, there’s a dazzling range of gadgets at the Gadget Zone, comprising Jumbo electronics, Relianace Digital, etc.. Then the students were explained about mall management, i.e. how a mall is being managed. Mall management encompasses operations, facilities management, security, accounts, common area maintenance, marketing, leasing and all the other functions related to a mall. Students were also allowed into a restaurant, to understand it’s operations. They went to the extremely popular Dine Restaurant, Chilis where they were even allowed to ask questions from the restaurant manager. For instance, full hall bookings are not being done by Chilis for say hundred people because they don’t want their other customers to be waiting. The students also got to know about the sundry services which the mall provides, which are highly appreciable, like that of ATM, Ambulance on call, ample parking, baby feeding room, baby stroller, bag and shoe repair, car wash, courier service, currency converter, doctor-on-call, fun cart for kids, golfcart, handicap washroom, kids play area, pharmacy, reserved parking for women, amongst the many others. Post the two hour guided tour, students then congregated at one of the Mall management office’s conference room for an interaction with the GM, Mall Operations. He handled all queries students had regarding every aspect of the mall from store location, to security management to parking requirements. Overall, students came out well versed with the detailing that goes in mall operations and store locations.